I bought five pounds of all-purpose and five pounds of bread flour during the first week of my stay in Florida. That was end of February. My time here is quickly coming to a close and I’m in a frenzy to use up everything I bought for my little pantry. Believe it or not, I think there is good chance I’ll finish those two bags of flour. That’s ten pounds of flour in five weeks. I don’t think I go through flour so quickly except for bake sales or holiday baking. Baking my daily bread obviously uses plenty of flour. Every loaf calls for a pound of bread flour. The batches of cookies, cakes, and pizza helped with depleting my all-purpose flour supply. I did not fully realize the scary amount of baking I did until I scanned through my Florida album. It is packed with so many photos of baked goods. No wonder Boyfriend wondered if I have been slacking off with training at all (no I haven’t). I remember a time when bread baking was daunting to me. Since discovering the streamlined method that Dan Lepard champions, I proudly join the ranks of home bakers with beautiful loaves emerging out of the oven. 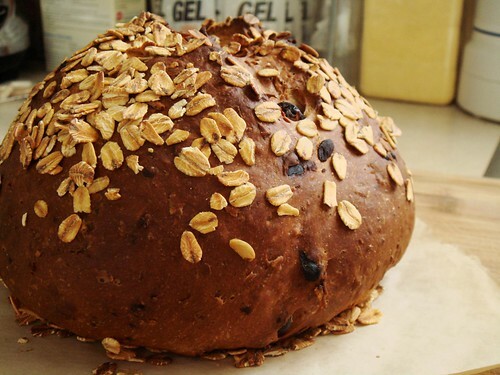 My pantry-clearing effort gave me a loaf of Double Cheese & Herb Bread yesterday and two rounds of Raisin Oat Boule with Dark Chocolate & Coconut. 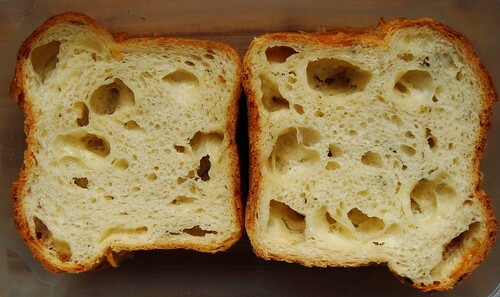 These are the kinds of “fancy” bread that I never buy from bakeries because they can easily cost over $5 for a loaf and I would still think the bakers are stingy with the add-ins. The dough itself is not complex at all. Baking them at home allows me to be generous with the goodies. The Double Cheese & Herb Bread is a family favourite. I only bake this as a treat because Little Brother and I can easily polish off a whole loaf in two days. Rather than grated cheddar, little cubes of cheese were kneaded into the dough to result in those large cheese pockets you see in the photo. Fluffy grated parmesan added saltiness and umami while a touch of cayenne offered a kick. I used a handful of scallions and thyme to emphasize the savouriness of this bread. I love to eat it plain but it is just as good as a sandwich. 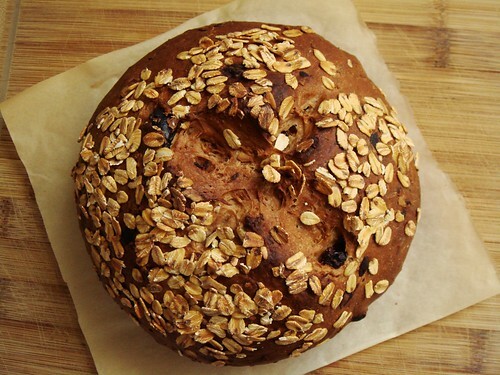 The Raisin Oat Boule conveniently used up lots of odds and ends in my pantry. With this bread, I proudly finished off the leftover oats, chopped dark chocolate, raisins, and coconut chips. All of these are ingredients I purchased for other recipes and I’m happy to see every last put to good use. As much as I would love to shape it into a loaf to justify my purchase of a loaf pan a few weeks ago, I shaped the dough into two boules instead. They are the perfect size for gifting! I get to keep one and the other will go to a hospitable new friend. She took me out for a traditional Colombian dinner last weekend that I enjoyed immensely. The least I can do to thank her is with some homemade goodies. 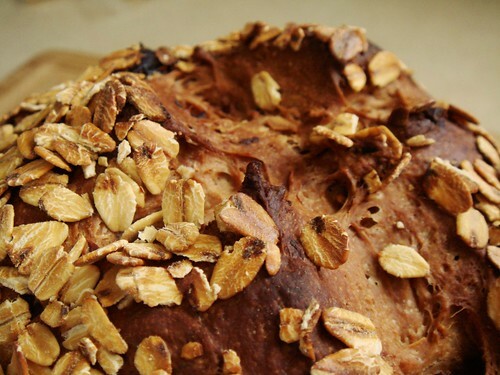 The recipe of this bread is loosely adapted from this Oat Cranberry Bread recipe. Too bad I didn’t record the ingredient amounts I used. 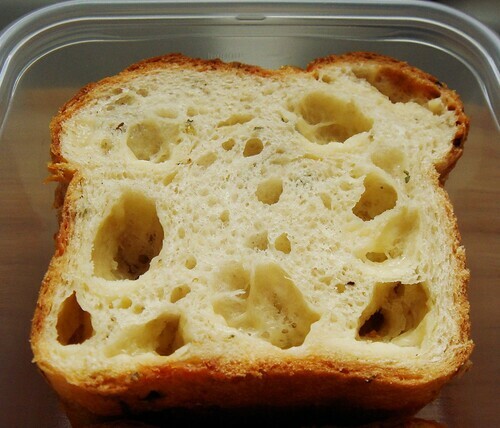 Boy, I would regret this oversight if the bread turns out to be fantastic! Finishing ten pounds of flour while on vacation is all the proof I need of how baking is tightly integrated into my life. For most people, time away from home is an opportunity to dine out and immerse in the local restaurant scene. I used to be part of the dining out set. But now, I see it as a chance to try ingredients from local markets and grocery stores that I cannot easily find back home. And I cannot be happier.